Display Type: LCD monitor / TFT active matrixColor Support: 24-bit (16.7 million colors)Image Brightness: 300 cd/m2Image Aspect Ratio: 5:04Image Contrast Ratio: 800:01:00Native Resolution: 1280 x 1024Contrast Ratio: 800:01:00Color Support: 16.7 million colorsHorizontal Viewing Angle: 160Vertical Viewing Angle: 160Viewable Size: 19"Pixel Pitch: 0.29.. 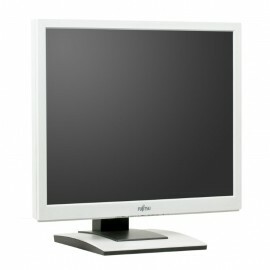 Display Type: LCD monitor / TFT active matrixAspect Ratio: 4:3Native Resolution: 1600 x 1200 at 60 HzContrast Ratio: 800:1Color Support: 16.7 million colorsControls & Adjustments: Brightness, color balance, input select, color temperatureDimensions (WxDxH): 17.5 in x 7.6 in x 14.4 inHorizontal Viewing Angle: +89 / -89Vertical Viewing Angle: +89.. Display Type: LCD monitor / TFT active matrix Native Resolution: 1280 x 1024Contrast Ratio: 1000:1Color Support: 16.7 million colorsControls & Adjustments: Mute, volume, brightness, contrast, H/V position, color temperature, phase, clock, black levelDimensions (WxDxH): 16.2 in x 8.3 in x 15.8 inHorizontal Viewing Angle: 170Vertical Viewing.. Display Type: LED-backlit LCD monitor / TFT active matrixDimensions: 16.2 in x 7.1 in x 14.7 inAspect Ratio: 5:4Native Resolution: 1280 x 1024Contrast Ratio: 1000:1 / 2000000:1 (dynamic)Color Support: 16.7 million colorsControls & Adjustments: Mute, volume, brightness, contrast, H/V position, input select, color temperature, phase, clock, black.. Display Type: LED-backlit LCD monitor / TFT active matrixAspect Ratio: 16:9Native Resolution: Full HD (1080p) 1920 x 1080 at 60 HzContrast Ratio: 1000:1 / 5000000:1 (dynamic)Color Support: 16.7 million colorsHorizontal Viewing Angle: 170Vertical Viewing Angle: 160Viewable Size: 23"Color Temperature: 6500KPixel Pitch: 0.265 mmPanel Type: TNBrightnes.. 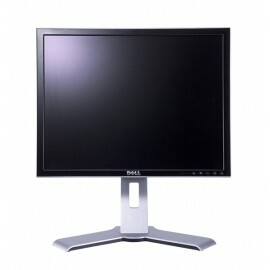 Display Type: LCD monitor / TFT active matrixViewable Size: 19"Native Resolution: 1280 x 1024 at 75 HzAspect Ratio: 5:4Panel Type: TNBrightness: 250 cd/m2Contrast Ratio: 1000:1Interfaces: DVI-D, VGA, 2x USBHorizontal Viewing Angle: 160Vertical Viewing Angle: 160Color Temperature: 6500KPixel Pitch: 0.294 mmHorizontal Refresh Rate: 83 kHzVertical Ref.. Display Type: LED-backlit LCD monitor / TFT active matrixAspect Ratio: 5:4Native Resolution: 1280 x 1024 at 60 HzContrast Ratio: 1000:1 / 1000000:1 (dynamic)Color Support: 16.7 million colorsControls & Adjustments: Brightness, contrast, H/V position, sharpness, color temperature, phase, clockDimensions: 16.4 in x 7.6 in x 19.1 in - with standHo.. Display Type: LCD monitor / TFT active matrixDimensions: 16.3 in x 9.2 in x 17.1 inNative Resolution: 1280 x 1024 at 75 HzImage Aspect Ratio: 4:3Contrast Ratio: 400:1Color Support: 16.7 million colorsControls & Adjustments: Brightness, contrast, H/V position, color temperature, phase, clockHorizontal Viewing Angle: 176Vertical Viewing Angle: 17.. Display Type: LCD monitor / TFT active matrixAspect Ratio: 16:10Native Resolution: 1680 x 1050 at 60 HzContrast Ratio: 1000:1Color Support: 16.7 million colorsControls & Adjustments: Brightness, contrast, color temperatureHorizontal Viewing Angle: 178Vertical Viewing Angle: 178Viewable Size: 22"Pixel Pitch: 0.282 mmPanel Type: TNBrightness: 250.. Display Type: LCD monitor / TFT active matrixNative Resolution: 1280 x 1024 at 75 HzContrast Ratio: 1000:1 / 7000:1 (dynamic)Image Aspect Ratio: 5:4Color Support: 16.7 million colorsControls & Adjustments: Brightness, contrast, H/V position, sharpness, color balance, gamma correction, color temperatureHorizontal Viewing Angle: 170OSD Languages:..